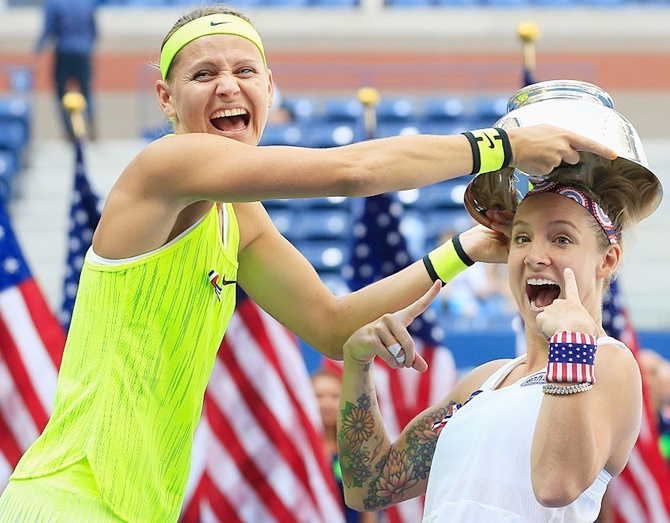 IMAGE: Bethanie Mattek-Sands, right, of the United States and Lucie Safarova of the Czech Republic celebrate with the trophy after defeating Caroline Garcia and Kristina Mladenovic of France in their women's doubles final of the 2016 US Open at the USTA Billie Jean King National Tennis Center. Photograph: Chris Trotman/Getty Images for USTA. Bethanie Mattek-Sands of the US and Czech Lucie Safarova fought back from the brink of defeat to steal the US Open women's doubles title, 2-6, 7-6(5), 6-4 over the French top seed partnership of Caroline Garcia and Kristina Mladenovic on Sunday. The French duo served for the match in the second set, but were broken, sending the set to a tiebreak, which Mattek-Sands and Safarova won 7-5. "It was a little bit of a slow start but I've got to give credit to our opponents," said Mattek-Sands. "They came out playing big, serving big, making all their rolls, ripping returns. "I think one of the things that we do really well is we don't get too down no matter what the score is." Mattek-Sands and Safarova carried their momentum into the third with a break to open the set and then held serve the rest of the way. With the win, Mattek-Sands and Safarova close in on a career doubles Grand Slam, having hoisted trophies at the Australian and French Open last year. Mattek-Sands said adding a Wimbledon title was not on her mind right now. "We have so many tournaments before Wimbledon," said Mattek-Sands, who wore Stars and Stripes knee-high socks and wrist bands on a day the US Open staged a remembrance for those who died in the 9/11 attacks on the Twin Towers 15 years ago. "I don't even know if we can start to think about it. "I mean, this is a huge win. We both looked at each other and we said, 'We have a US Open trophy right now'. "I think especially being 9/11, it's really a big thing to enjoy the people you're with, enjoy the moment. I get a little emotional."